When Hamilton first introduced wrist watches you could count the number of models on one hand... well, really you could do it on one finger but very quickly there were a few different options. One of the ways Hamilton differentiated models was to offer multiple different dial options. This was already a long-standing standard practice for pocket watches and by the 1930's there were a couple of dozen men's models and many of them had two or three different dial options. One of the first catalogued models to feature a black dial was the 1938 Dunkirk... although the honor of first to offer a black dial is shared with the Otis from the same year. Originally the Dunkirk only had a black dial but the following year (1939) it was also offered in a traditional silver butler finish. I've often wondered why Hamilton chose the name Dunkirk for the watch. It's not a traditional men's name or a famous resort or explorer. One thing is for sure, it wasn't in remembrance of the battle of the Dunkirk, as that didn't occur until 1940. Although the Dunkirk was produced through 1940 I don't think you see them for sale very often. That could be because it retailed for $125, the same as the solid 18K gold cased Richmond, and was considerably more expensive than other solid 14K gold models of the period that retailed for $100 or less. 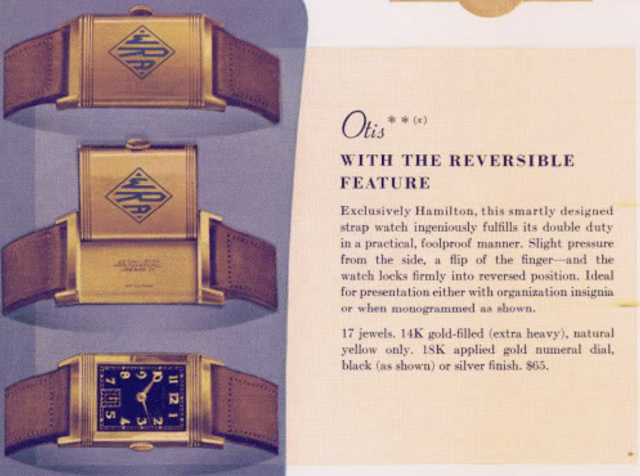 Conversely, the gold filled Otis retailed for $65... now that would be a bargain as today a nice Otis will fetch upwards of $2.000. My project watch came courtesy of someone who inherited it from their father. As a family piece, it's a wonderful heirloom and definitely worthy of being restored and enjoyed. Looking at the watch, it has the silver dial so it's either a 1939 or 1940 model. It's a bit grungy and needs a new crystal but it should clean up nicely. The metal bracelet is't original but it is period correct and I think it looks great with the watch. The back of the watch is unengraved and shows very little wear. The only thing that looks a little off is the crown is protruding from the side of the case and could be set a little deeper in the recess on in the side. The design of the case is very interesting. The back is complicated and the bezel actually snaps into the inside of the back on the sides but the outside of the back on the top and bottom. This gives the Dunkirk bezel a two-step frame appearance. 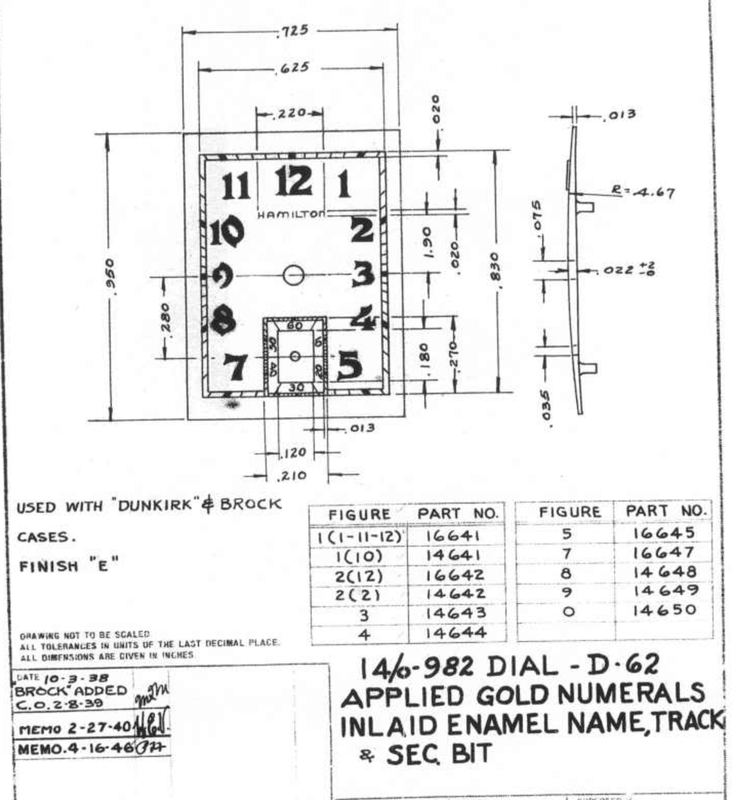 The silver dial on the Dunkirk is the same pattern as the dial on the 1939 Brock, although the Brock did not have the black dialed option. Of course the Brock came in yellow, white and coral gold with three different dial choices, so there were still lots of options - but not black. Speaking of the Brock, the bezel of the Dunkirk looks just like the bezel of the Brock and the two models share the same crystal (I believe). To put it in perspective, the Brock is also solid 14K gold but it retailed for $77.50 in 1939 - considerably less than a Dunkirk. 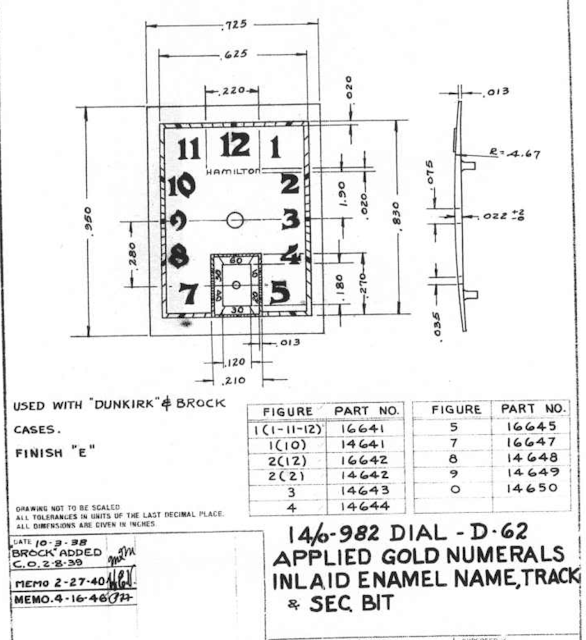 The Dunkirk was outfitted with a 19 jewel 14/0 sized 982 movement but in 1940 the 982M "medallion" movement was introduced for models with solid gold and platinum cases. This Dunkirk has a 982M movement with a serial number that dates to 1940 making it easy to date the watch. Here's a shot of the uniquely shaped case back. This watch has four or five past service marks inside so it was well cared for. Most of the 980 / 982 movements I see have a blue steel mainspring that has "set" and needs to be replaced. The mainspring in this watch's barrel is a white alloy spring so I will clean it and reinstall it. A new crystal will be a nice improvement to the watch's appearance. Everything is clean and ready to be put back together. I like the 982M. It's not my favorite movement to work on but it is my favorite in terms of the appearance and overall design. A lot of care and craftsmanship went into the creation of every 982M and the solid gold medallion in the train bridge is a testament to the quality of the movement. This movement is a beauty to behold, which is interesting since only watchmakers would ever have the opportunity to look at it. The reassembled movement is running very well. I might speed it up a tiny bit but it's running pretty much right on the money. Looks like I need to trim about 1/32 of an inch off the length of the stem. That will bring the crown in a little closer to the side of the case. The dial on the watch has a 70 year old patina on it and it looks very good in normal light. My light tent gives the dial a slight green tint. One thing I noticed in the light tent is the 1 and 2 in the 12 has some sort of tarnish on them. I used a sharpened piece of peg wood with a tiny amount of Simichrome polish to remove the spotting on the numerals and then cleaned them off with rodico putty. Just to show you what it looks like in regular day light, check out this finished project. The bracelet is too short for my wrist but I'm sure the owner will love to give this wrist some well-deserved wrist time. Great to see a Dunkirk on the bench Dan. What a great heirloom. I’ve often wondered about the naming of the model. Aside from the WW2 evacuation Dunkirk was/is a French resort town - have Hamilton named any other models after places outside the US? Yep, at least one and also French, the Touraine.